The automotive industry is one of the fastest growing industries in the world, and it is directly related to the synthetic rubber industry. About 75% of the world’s rubber production (both natural and synthetic) is involved in the production of tires. In other words, the automotive end-user segment dominates the global synthetic rubber market. The rapid growth of the automotive industry, especially in the Asia-Pacific and the Middle East & Africa region, is driving the demand for synthetic rubber, due to its diverse and various applications. China developed a technology, in which synthetic rubber increasingly replaces natural rubber in the production of car tires, especially for passenger cars, which occupy a dominant (75%) and a growing share in the global automotive market. This caused a significant structural change in the global rubber industry. The consumption of synthetic rubber has expanded constantly in the past decade and currently contributes above 55% of the global rubber consumption. The above factors are likely to have a deep impact on the global synthetic rubber market in the coming years. SBR was earlier marketed as Buna-S. It is made up of a combination of styrene and butadiene in a 3:1 ratio by weight. It can be produced through two processes, namely, emulsion polymerization and solution polymerization. Styrene-butadiene rubber has the largest market share in the synthetic rubber market. This is due to its good aging stability and high abrasion resistance, which make it the material of choice, for use in the tire manufacturing industry. Around 50% of the car tires are made up of SBRs, present in a blend with natural rubber. 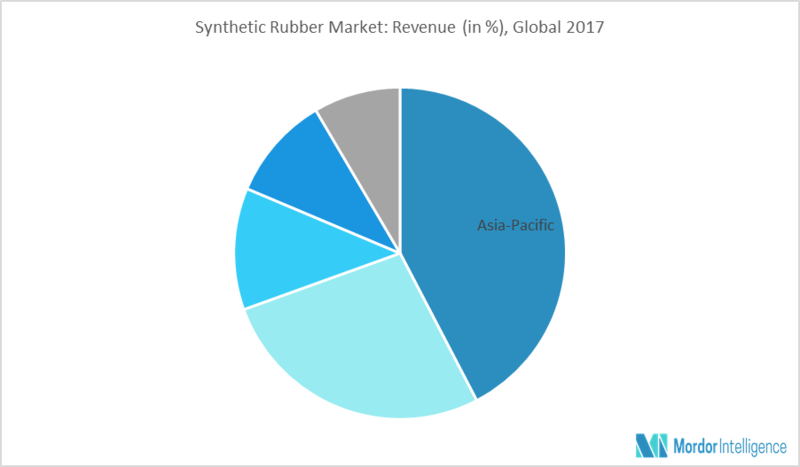 Styrene-butadiene rubber is expected to be the second-fastest growing segment by type in the global synthetic rubber market. China has been among the fastest growing economies of the world for the past several years and represents huge potential opportunities for the market studied. In the Asia-Pacific region, China accounts for the lion share of the region’s synthetic rubber market. Being a developing country, rapid industrialization is taking place in China, which has, in turn, led to a huge demand for synthetic rubber in various end-user industries. China is currently the world’s largest producer, as well as consumer, of synthetic rubber. All the aforementioned factors are expected to boost the growth of the synthetic rubber market in the country. Major Players: Asahi Kasei Corporation, Changshou Chemical Co. Ltd, Denki Kagaku Kogyo Kabushiki Kaisha, DSM Elastomers, amongst others. June 2017: ExxonMobil (XOM) completed the acquisition of Jurong Aromatics, which owned one the largest aromatics plants in the world.